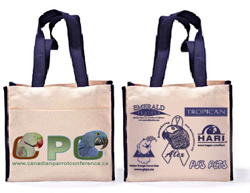 In 2015, the Canadian Parrot Conference has once again provided opportunities for corporate organizations to support and visibly be recognized at our conference. Please contact us to inquire more about corporate sponsorship. We would like to thank HAGEN/HARI for their continued support of the Canadian Parrot Conference in 2015. We welcome and thank our newest major sponsor who is very active in raising funds for the annual Pennies4Parrots challenges as well as bringing Barbara Heidenreich of Good Bird Inc. to our conference this year!